What’s a Big Cheesy Pimento Cheese Burger? It’s a burger recipe with Roots in the South… and the North! I’m a Southern boy raised on Southern Flavors and that includes the goodness that is Pimento Cheese. I have to admit, for a while… I lost my love for the orange spread that’s cloaked in ingredient secrecy. I mean, when you’re first served up some pimento cheese and you’ve never tried it before you have to wonder…”What is this Glowing Orange Goo?” But, then you taste it, and you are hooked. So why did I loose my love for pimento cheese for a brief while? Well, all I can say is that… I have no idea! I’m blaming being busy with life and writing, research, and more. Thankfully my wife Ally makes some awesome pimento cheese, my best friend Wes has his own amazing recipe, and our friend, the good lawyer Jerry Tidwell, introduced me to Pimento Cheese Burgers! Pimento Cheese – A Creamy Northern Thing! I’ve been told that Pimento Cheese is a flavor found in the south! That it’s a Southern Dish! That’s true – a pimento cheese offering at a Southern cookout or picnic is a given. It’s like cooking a bratwurst in beer – it just goes together! However – according to some foodies the “Southern traditional dish” may have roots in… NEW YORK and other Northern states! According to writer Robert Moss in his article From Scientific Cuisine to Southern Icon: The Real History of Pimento Cheese, the cheesy concoction is the result of several food innovations coming together. In the late 1800’s Cream cheese was hitting the shelves, canning was improving, tasty red peppers were being imported, and consumers were making their own versions of pimento cheese. By 1910 food manufactures caught onto the craze and finished pimento cheese products started showing up in markets. National brands soon followed. Most of the production, according to Moss’s research, was in New York and Wisconsin. The thing to remember is that Cream Cheese was the main ingredient in these versions of Pimento Cheese. However, processed cheese version were also becoming popular after World War Two- as shown in the above picture of an A&P Pimento Cheese product courtesy of Ednas Ruths Attic shop on ETSY. The Pimento Cheese recipe was beginning to Blur. Where does the South Come in? Well, there are a few things to consider. First – You can thank several innovative southern farmers and producers around the Griffin Georgia area for cementing Pimento Cheese as a Southern Classic! By the mid 1920’s the state of Georgia, mostly centered around griffin, became a hotbed of domestically grown Pimento peppers. Plus, improvements in manufacturing made the peppers easier to peel. By 1938 The country’s largest packer, Pomona Products Company of Griffin, was producing 10 million cans of pimentos per year. Then, following World War II, southern kitchen gurus seemed to alter the basic Pimento Cheese recipe! Instead of a creamy, Philadelphia cream cheese, based recipe – Southern cooks swapped out “creamy cheese” with shredded cheddar. But, they still needed “creamy” which means they started reaching for Mayonnaise! Also – Have you ever heard of the Masters Golf Tournament? The Pimento Cheese Sandwich is a historic staple of the event; as shown by the picture of shelves loaded with green wrapped baggies courtesy of TheTeeSheet.com. Combine the three factors and you have a boiled down version of why the South loves pimento cheese! Since my introduction to the Pimento Cheese Burger I’ve included a version of that tasty burger in each of my cook books including my newest title – Great American Grilling. 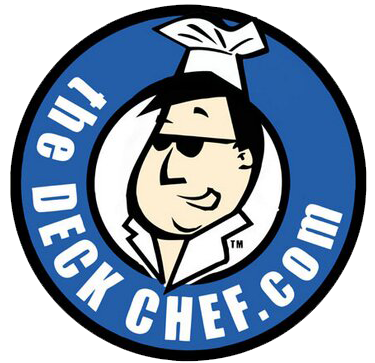 This version is my newest concoction and the Great American Grilling cookbook version can be found HERE. 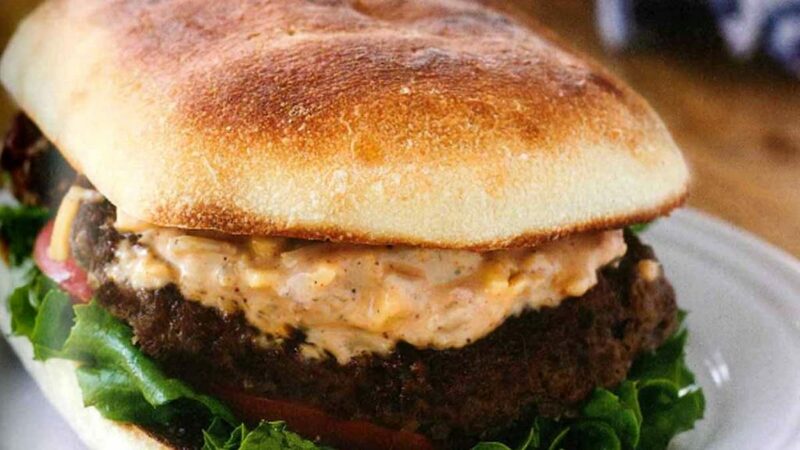 Sure, you can make a hamburger and top it with Pimento Cheese. That’s the traditional way to make a Pimento Cheese Burger. But why stop there? Have you ever thought about adding some shredded cheese to your ground beef? How about this – a burger with shredded cheese in the beef, then stuffed with pimento cheese, and then topped with even more pimento cheese. Here’s the recipe which are really loose guidelines. Add about 1/2 cup of shredded cheddar cheese to your ground beef. You’re making four burgers but you’ll need eight patties. Here’s why! Separate the beef into eight equal portions. Form eight thin patties. Lightly season all of the patties with salt and pepper. Spread some Pimento cheese onto the center of four of the patties. Don’t go to the edges. Next, place the four remaining patties on top of the pimento cheese covered patties. Pinch and form the edges to seal making four, huge, pimento cheese stuffed burgers! Brush lightly with steak sauce and grill as you normally would. When the Big Cheesy Burgers are done – serve up topped with more pimento cheese, your favorite toppings, all on a deli fresh bun!